Session in Honour Prof. SÁIZ. The poster size is A0 portrait (width x height = 84 cm x 119 cm). We will provide removable poster strips for mounting the posters on the display panels. The talks are scheduled for 15 minutes, the questions and discussion will take place at the end of each session. Only presentations using MS Powerpoint format (.ppt or .pptx) or Adobe PDF format (.pdf) can be displayed. If you use other programs to generate your slides, please convert them to the appropriate format and test in MS Windows environment. The talks are scheduled for 20 minutes, the questions and discussion will take place at the end of each session. Only presentations using MS Powerpoint format (.ppt or .pptx) or Adobe PDF format (.pdf) can be displayed. If you use other programs to generate your slides, please convert them to the appropriate format and test in MS Windows environment. Authors of the best presentations in “Nanomaterials and other Products for Conservation”, will be asked to prepare a paper, for a special issue of the “Materials ” (impact factor 2,728). More information in Journal Special Issues tab. 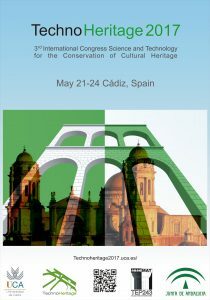 Authors of the best presentations in all the topics of the Congress, will be asked to prepare a paper, for a special issue of the “Journal of Cultural Heritage” (Elsevier, impact factor 1.533). More information in Journal Special Issues tab. 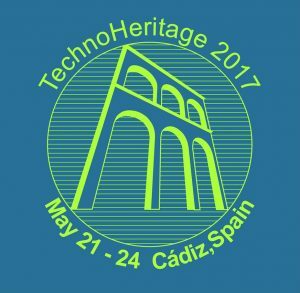 The response to the Technoheritage 2017 call has been overwhelming. We have received above 200 communications, with a high scientific quality, from 23 different countries. IBERIA Airlines extends a discount (10%) to congress attendees. More information in “Venue”. The Jerez Fair (Feria del Caballo) will held in Jerez de la Frontera (located next to Cadiz) from 13th to 20th May, 2017. http://turismojerez.com/index.php/es . A special session entitled “Biodeterioration: fundamentals, present and future perspectives. Session in honour of Prof. Cesáreo Sáiz Jiménez” will be held. More information in Session in Honour Prof. Sáiz tab.